The committee received testimony on the public policy ramifications of protecting infrastructure to ensure transportation safety and efficiencies provided by GPS. Government and industry witnesses warned that LightSquared's proposed terrestrial network would disrupt many aviation GPS receivers, including FAA requirements for low-altitude operations in the vicinity of LightSquared transmitters. 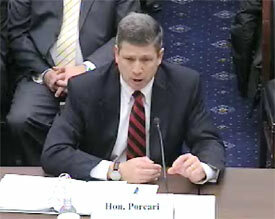 Deputy Secretary of Transportation John Porcari proposed that federal agencies work to draft new GPS spectrum interference standards to help inform future proposals for non-space, commercial uses in the bands adjacent to the GPS signals, to strengthen existing national policy protection of adjacent band spectrum.